A Soldier’s Gift | I am Flippish! In light of an impending war, and the anniversary month of 9/11, I wanted to write about something positive — about a precious gift we received and still cherish. No, it is not an expensive gift like jewelry or an electronic toy, but it is a priceless gift that money cannot buy. The idea for this blog came from my twelve year old son who decided to write an essay for his homework about two special souvenirs he received three years ago. Until now, I did not realize the impact this gift has made on my children. My family and I love to travel as much as we can. We love to see new things, eat the local food, and collect souvenirs. My two children have collected many souvenirs from every place they visited – Philippines, Italy, Singapore, Hawaii, Mexico, Hong Kong. Some of the souvenirs are cheap tchotchkes that broke after we got home, disappeared somewhere in our house, or is now gathering dust in a corner shelf in their bedrooms. The mean mom that I am would get rid of some of the junk, and surprisingly they did not miss or ask for them. For the most part, my children remember where they got each surviving souvenir, but the rest, unfortunately, remain insignificant. As a mother who abhors clutter, I rather put them all in a box instead of giving my housekeeper another tchotchkes to dust. However, there are two unlikely souvenirs my family and I treasure with all our hearts. They are a small can of 7-up and a cheap plastic pen. How could a can of 7-up and a cheap plastic pen be so important to a family? Pretty laughable, right? These two items are kept in a safe place. The soda will never be opened and drank, nor the pen will ever be used to write something down. One time my husband accidentally put the soda in the fridge, and my kids threw a fit. Yes, that is how valuable they are. We received these items three years ago as a gift and to this day my children still remember how we got them. They tell the story to their friends just like it happened on a recent trip. That is how much we treasure them. Even my husband who is not a sentimental person, he too now respects our treasure. It happened three years ago when we decided to spend spring break in Oahu, Hawaii. We noticed many soldiers on our flight from LAX and happen to sit across of one of them. They were all young. Young, exhausted, and battle weary. Many of them slept for most of the flight. Some just stared off into space, deep in their own thoughts, maybe relishing the peacefulness of their surroundings. My husband told me that they probably have been traveling for over 24 hours from Iraq or Afghanistan. As I tried to get comfortable in our narrow seats, he also added that the uncomfortable economy seats are probably the softest bed they slept on in months. I could not imagine what these boys went through, and my heart went out to every one of them. My nine year old son who is a military buff was in awe to see real soldiers up close. Airlines nowadays no longer serve free food on flights from Los Angeles to Oahu but have boxed lunches available for purchase. With two picky eaters, I packed lots of snacks such as string cheese, cookies, candy, and for lunch, several slices of cold pizza. As the flight attendant began drink service and selling their boxed lunches, passengers began taking out their wallets and purses to buy their food. The soldier next to us was awake and looked as if he wasn’t going to buy any lunch. It was a five hour flight, and I was sure he was hungry. My husband and kids were starving by that time, so he probably was too. I nudged my husband and motioned him to buy the soldier some lunch. He understood and gave the menu to the soldier and told him to order whatever he wanted to eat and beer if he wanted that too. The young soldier gratefully accepted the lunch but politely declined the beer. I saw that he was ravenous. He ate everything, savoring every bite. When was the last time this soldier ate? Airport food is not cheap, and I don’t blame the kid for not spending a fortune on crappy airport food. I took out our pizza and doled them out to my husband and two children, I wondered how long since this soldier had pizza, so I gave him a slice too. Yes, I didn’t offer it, I just put it on a sheet of the paper towel I brought and placed it on his tray. He gave me a big smile. I think he hasn’t had American pizza in a long time because he seemed to savor it too. I normally don’t give food to strangers in an airplane it was just that my mama bear instinct kicked in. This young man is not only a son of a mother I don’t even know, but he is also our country’s son. He is giving his life to his country, fighting for us while we sleep peacefully in our warm and comfortable beds. As a mother, I know what it is like to worry about my children if they are eating properly, or taking care of themselves. Albeit they are still young, I cannot imagine being far away from my child let alone know that he is constantly in danger fighting for our country. After lunch, the soldier took a nap and so did my children and husband. After an hour or so, my children woke up and were hungry again. What is it with flying that makes my children constantly hungry? I dug into my snack bag and took out string cheese, Goldfish crackers, Oreos, and apple slices. Then I divided them into three – my two kids and the soldier across from us. When I placed the snacks on the soldier’s tray, he protested that he couldn’t take the kids’ snack away from them, but my kids assured him the snacks were good. My kids probably thought he didn’t like them. I told him to save the snacks for later in case he gets hungry. Out of the corner of my eye I saw him munching happily just like my kids. It made very happy to see him enjoying himself. The soldier slept during the remainder of our flight, and once we landed, he profusely thanked us for feeding him throughout the flight. We thanked him for fighting for our country, which, was far more important than our mere offering of pizza and snacks. After we picked up our bags, my husband had to take a shuttle to get our rental car. While waiting for him, the soldier ran up to us and asked us to wait until he got his bag because he wanted to give us something. The soldier had to wait a long time to get his bag, and he frequently glanced at us as if he was afraid that we were going to leave. I texted my husband to take his time so that it gave the soldier some time to get his things. The bag finally came out of the conveyor belt, and he walked over to us and rummaged through his bag and took out a can of 7-up and a pen. “I really appreciate your kindness in feeding me, and I just want to give you these humble tokens of appreciation. I was in Iraq, and this can of 7-up is written in Farsi, and this pen printed with a hotline is what we distribute to the locals during our patrols so they can call us with leads. They are just little souvenirs for the kids,” he said. The kids and I were surprised to receive a present. I never expected anything from this young soldier. I did what every mother would do without a second thought. We chatted while I waited for my husband to return with the rental car. We found out he is a Sergeant on a two week leave from Iraq. His wife gave birth to a baby girl three months ago, and he was going to surprise his wife and see his daughter for the first time. My son Sean asked him some questions about Iraq and what he did over there. Sean loves anything that has to do with the military – past or present. To be able to talk to the soldier was one of the biggest highlights of his trip. By then my husband texted me to tell me he was out front. I offered to take him to where he needed to go, but he declined and was going to rent a car. He offered his hand, but I gave him a hug instead and told him to enjoy his time with his family and to stay safe for the sake of his wife and daughter. During our week long trip, my children talked about the soldier and how cool it was that he gave them presents. They told the story to the relatives we visited during our vacation. They even brought it to school for show and tell after we got back from vacation. 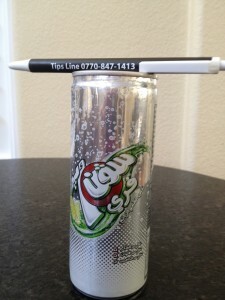 Throughout the years, my kids would still proudly show the 7-up can and pen and tell the story to their friends. This is one story that will never get old. I don’t think the soldier knew how much his simple gifts had an impact on my family. We live in a very material world where everybody clamors to get the latest and greatest toy or gadget. Today’s gadget and toys are obsolete a few months later, discarded by their owners like Woody in Toy Story. I am proud to say that my children still treasure the 7-up can and pen which is safely kept in a place where we could see it. To my family, the 7-up can and pen is a symbol of the men and women sacrificing their lives to fight for our country and to remind us to be grateful for being able to sleep in our soft, warm beds every night and not be afraid of bombs, IED’s, and bullets when we walk out of the safety of our homes. Every time I see these objects, I remember to say a prayer for the safe return of the soldier who gave them to us, along with all the soldiers fighting for our country. Last Friday, my son finished his essay and returned the 7-up can and pen in its rightful place. He informed me the can of 7-up has expired. I told him it didn’t matter if it expired because we were never going to drink it anyway. He agreed. I then asked him why he wrote an essay about a gift he received three years ago. This is what he said. Yeah, I agreed the soldier is a cool cat. Funny thing is we remember what he looked like, and every detail of the story, but we never got his name. Keep safe soldier, wherever you may be. This entry was posted in Book Signing by Leslie V. Ryan. Bookmark the permalink.